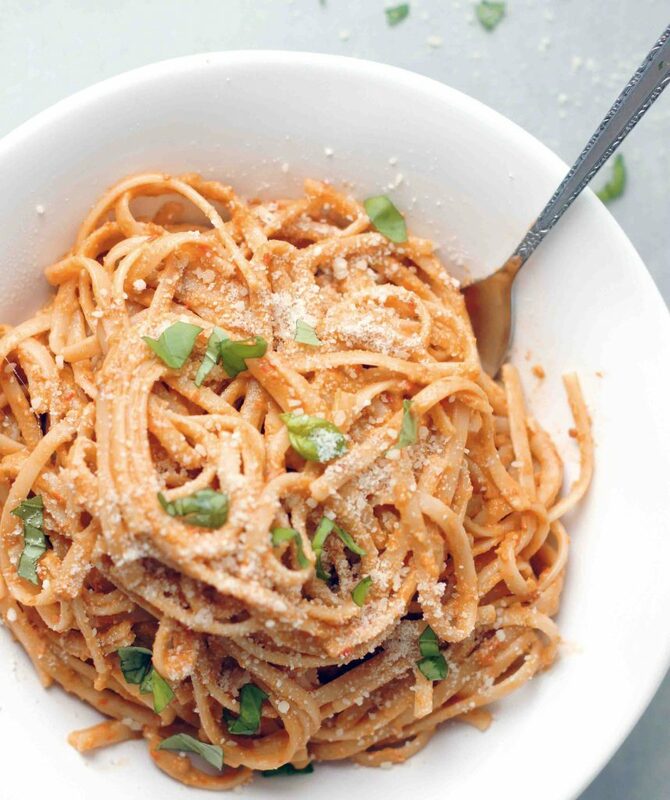 Packed with flavor, this Pasta with Tomato & Almond Pesto is a hearty, delicious, meatless meal that comes together in about 20 minutes. This Pasta with Tomato & Almond Pest saved me the other night. I had no clue what to fix for dinner, I hadn’t taken meat out of the freezer and I was just too tired to even think. Enter this pasta. 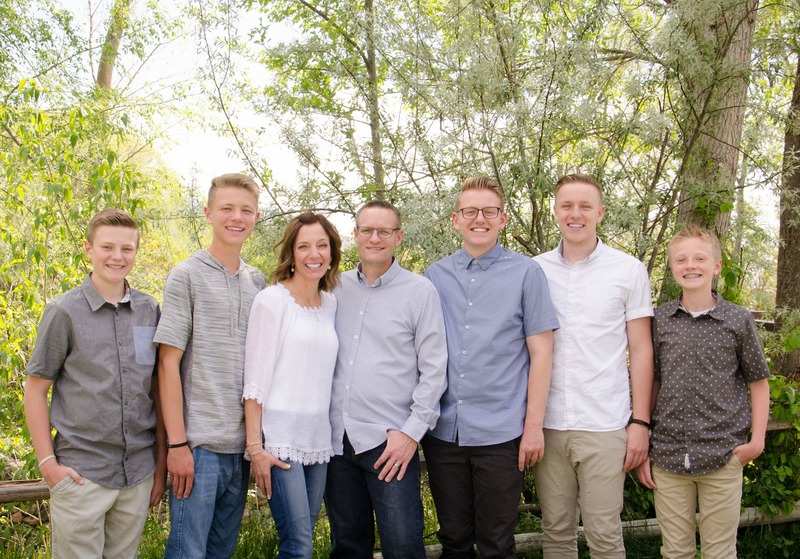 . . It’s amazing, and simple, and fast, and was loved/devoured by every single one of my boys (that is sayin’ something!). Another great thing about this pasta is the fact that you don’t even have to turn your oven on, which is always a fabulous thing when it’s 95+ degrees outside. 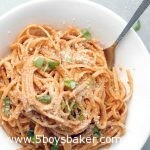 Pasta is one of those safe meals at our house, so I knew my boys would love this. Plus, the fact that they request this pasta dish all the time, I wasn’t the least bit worried I would have to force them to eat it. I’m telling you guys, this stuff is so scrumptious! Fresh tomatoes, fresh basil, and parmesan cheese . . . words can’t even begin to describe how good this is. Perfect for when you want a meatless meal or serve it along side some grilled chicken, yum! It comes together in 20 minutes. Easy peasy and so, so good! Get ready to fall in love with this. It might just become your go-to pasta dish. It’s fast, refreshing and so, so simple to make. Toast almonds in small skillet over medium heat, stirring frequently, until pale golden and fragrant, 2 to 4 minutes. Set aside to cool. 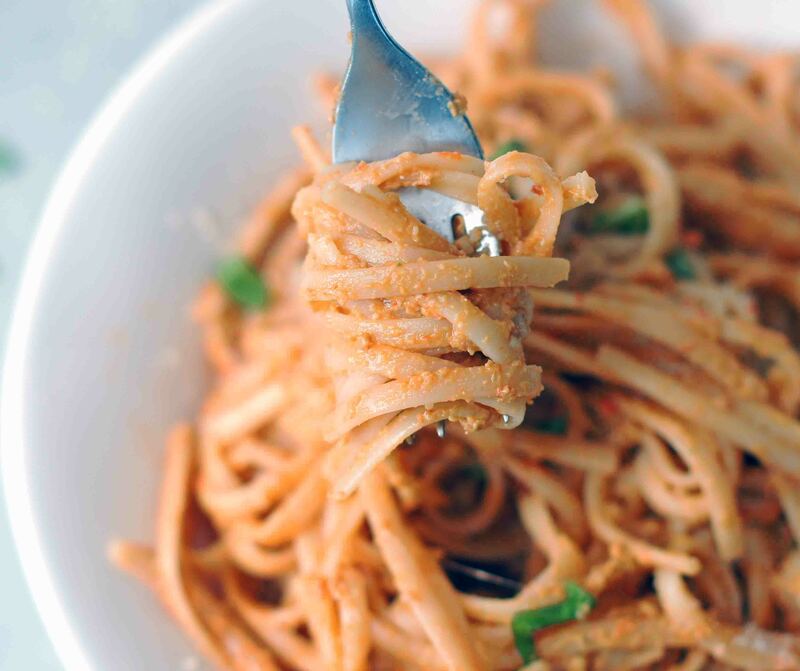 In a food processor, process cooled almonds, tomatoes, basil, garlic, red wine vinegar, red pepper flakes and salt until smooth, about 1 minute. Scrape down sides of bowl with rubber spatula. With machine running, slowly drizzle in the olive oil, about 30 seconds. Set pesto aside. Bring 4 quarts water to boil in large pot. Add pasta and 1 tablespoon salt and cook until al dente. Reserve 1/2 cup cooking water; drain pasta and return to the pot. Stir in the pesto and 1/2 cup Parmesan into the cooked pasta, adjusting consistency with reserved pasta cooking water so that pesto coats pasta. Serve with extra Parmesan, if desired. This is SO yummy! I just told Jason it’s one of my most favorite things I’ve ever made. Thank Kami! I am so happy you loved it. I am so in love with it, you just have to taste it to see how good it really is! Thanks for letting me know. I made this tonight for the second time and I can’t believe I forgot to post a comment the first time!! This is so good and flavorful, especially with cherry tomatoes from the garden! Made a salad and had a glass of wine and dinner was perfect! Thanks Christine! 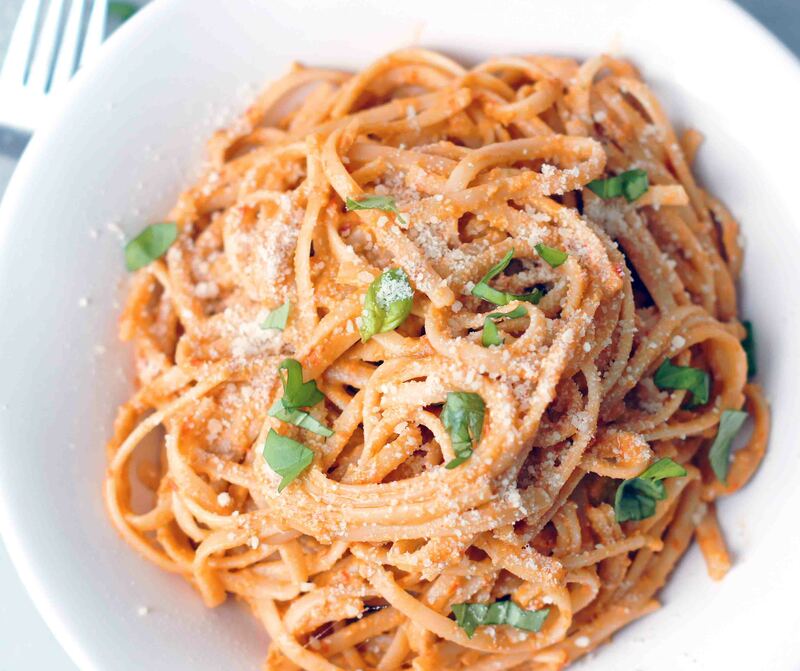 We absolutely love this pasta and I love how quick and easy it is!